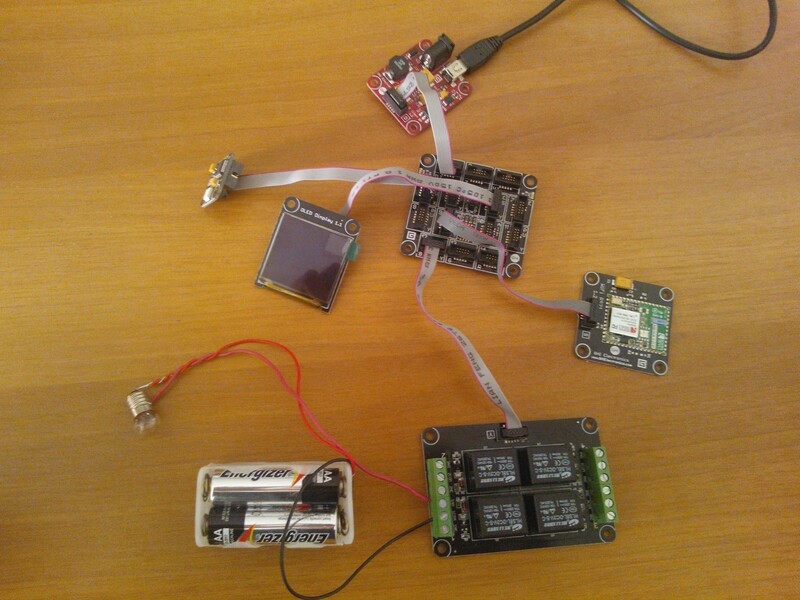 Relay (the most important), that allows to create a swith controlled by .NET Gadgeteer. The resulting system is shown in the following screenshot. 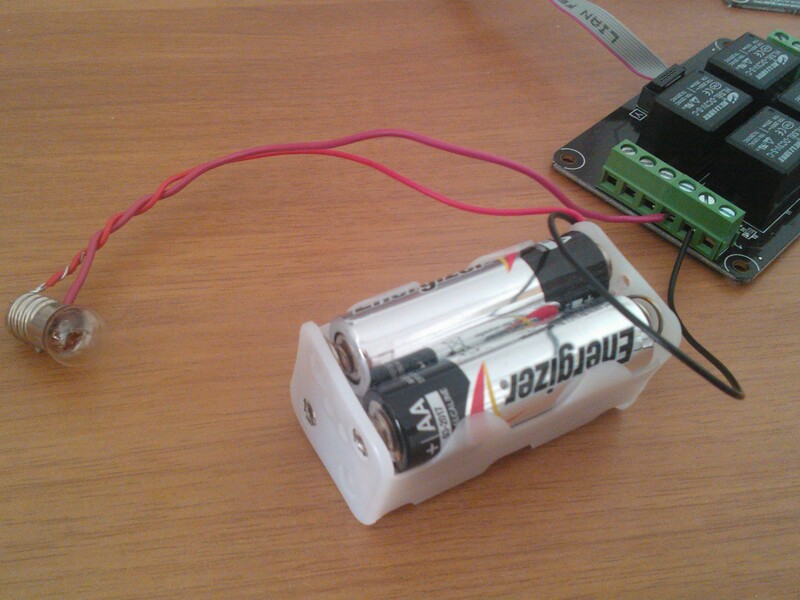 So, we can create a simple circuit connecting a battery pack to a light and to the Relay module, as you can see in the next image. Before actually setting the connection, we make the led blink, to notify that the device initialization is in progress. Note that my Multicolor LED has the green and blue color swapped, so I need to set the GreenBluetSwapped property to true in order to show the correct color. // Create the services to manage the switch. the second on path get_switch, to get the current status of the switch. If a request comes for the set_switch path, we use the GetParameterValueFromURL method to get the query string value of the mode parameter. If it is on, we set the Relay1 property to true, closing the circuit: in this way, we turn the light on. If, instead, the value is different from on, we set the Relay1 property to false, opening the circuit and then turning the light off. After that, we use the Respond method to send a response back to the client, with the current relay status. When the device receives a request for get_switch, it simply returns the current switch status. In all cases, the response is a string in the form switch_status: true|false. Now, we need to write the code to communicate with the .NET Gadgeteer device. As the device exposes its functionalities using the standard WebEvent mechanism, that is accessible via HTTP, we’ll use RestSharp to simplify the task. We can add it to the project using NuGet (just search RestSharp). // Sends command to turn-on the switch. // Sends the command to query for switch status. // Creates the request using RESTSharp. In the btnSetIPAddress_Click method, we first check if the IP address inserted in the TextBox is correct. In this case, we get the current switch status, using the GetSwitchStatus method, which in turn calls SendRequest on the /get_switch resource. The SendRequest method realizes the real work. We create a RestClient object that points to the IP address we previously set, then we instantiate a RestRequest class, using the specified request URL and the HTTP GET method. The request is sent to the device using the ExecuteAsync method, that is executed in background. When it completes, the action specified as second parameter is called: we check if it succeeds and then we examinate the response. As we said earlier, it contains a simple boolean value telling if the light is on or off. We use this value to determine the image to use in the UI. When we press the Turn on or Turn off button, we create a request on the /set_switch resource, setting the mode parameter according to the pressed button (on or off, respectively). This entry was posted on July 5, 2012, 1:25 PM and is filed under Embedded Microcontrollers, REST Web Services. You can follow any responses to this entry through RSS 2.0. You can leave a response, or trackback from your own site. I’m curious, which parts remain required to run the switch independently? The USB and LED are just to get info and to program the whole thing? 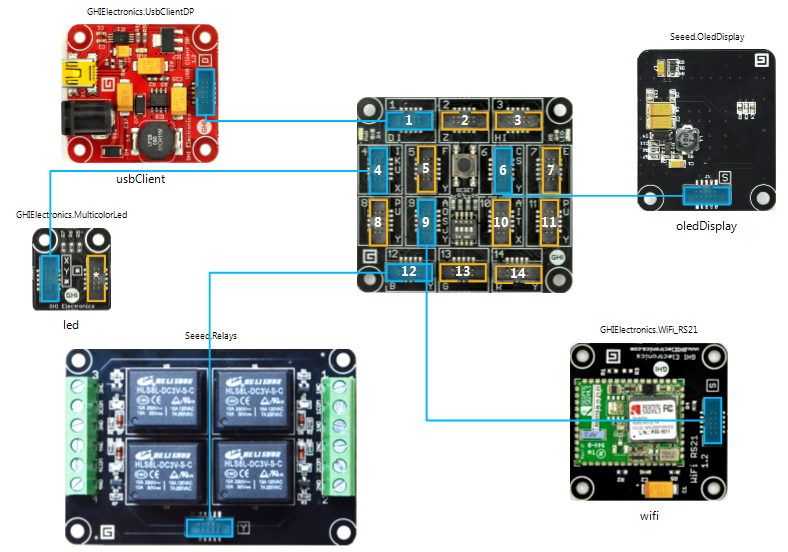 LED is optional, but you need the USB Client DP module in order to connect a power source to Gadgeteer board. 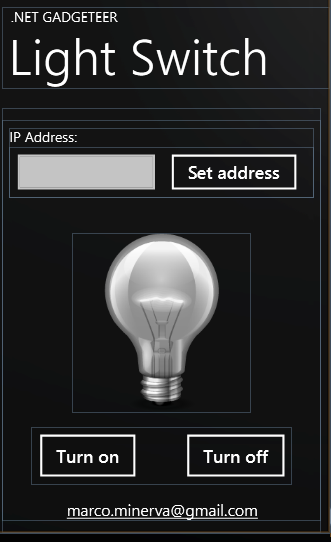 Mmm, I’m just in search of an easy system to control all my lightswitches through wifi, preferably cheap. Any change you might point me into a direction? Are you searching for something existing, or do you want to develop your own system? Either, I pretty comfortable in .NET #, but don’t mind doing it in other languages. How many switches do you want to control? And they are near each other? Otherwise, instead of .NET Gadgeteer, you probably should take a look to Home Automation argument: http://en.wikipedia.org/wiki/Home_automation. around 30 switches I think. Wikipedia, why didn’t I think of that -.- .. *feeling stupid* I guess it’s time to digg up my electronics courses again :p – big thanks for the info! i want to make a project in which light switches can be operated using phone and light can be on and off frm anywhere?? See this post: http://wp.me/p1TEdE-jF I’ve used this model to control lights and other appliances from anywhere with my phone.